See more about: Page Background. 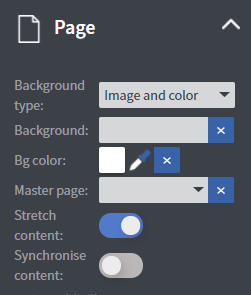 You can set a page to be your master page. You can also stretch and synchronize your content here. In the Data Binding Menu you can connect a data source to your content. 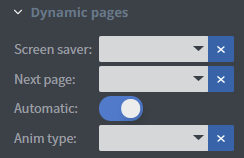 In the Dynamic Pages Menu you can set a screen saver. In the Comment Menu you can leave a monitor control command for the screens. In the Receiver Menu you can set a receiver e-mail to receive the collected data from interactive elements. See more about: Interactivity.